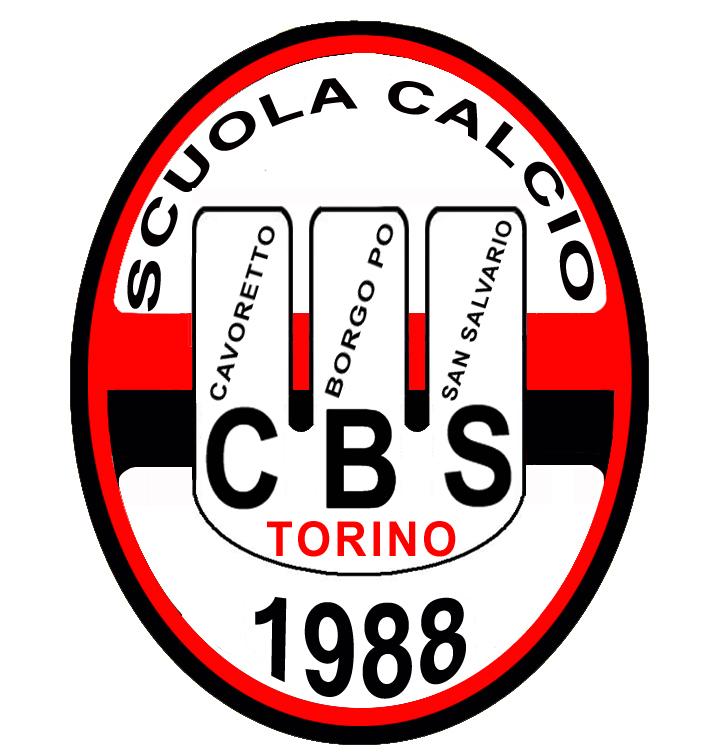 CBS Scuola Calcio is an amateur football club from the northern city of Turin who were formed in 1988. The CBS intials represents three villages by the side of the Po; Cavoretto, Borgo Po and San Salvario. Another village, Pilonetto on the east bank of the river became part of Turin as the city grew. Pilonetto had its own little football ground; Cavoretto, where amateur and youth teams played. Gradually several amateur clubs in the area began to merge to make the best of the facilities on offer. Those involved with the formation of the club would meet at the bar Giardino di Piazza Zara on Corso Sicilia. It was decided because of the youth background that Scuola, the Italian for school football should be in the title with CBS. The club was known as CBS - Scuola Calcio Napoli soon after in tribute to Diego Maradona, a hero of the day. The club organised the annual Trofeo Vulcaflex for teams in the area, while the venue at Corso Sicilia was developed by the lido, with the pitch being rotated ninety degrees. In 1994 the tournament was renamed Forza Azzurri in tribute to the Italian national team competing at the World Cup. Dr. Patrassi and Christian Bourrel who occupied important positions at the football school of AC Milan got involved at the club after meetings in 1994 as the team began to play in red and black striped shirts from the previous blue of Napoli as the club took on its current title. With the Turin Winter Olympics of 2006 upcoming the city council received funding and CBS pressed towards installing a new artificial pitch, which they got in 2004. Giancarlo Nanni took over as head coach in 2006-07 as the team began to progress. By the time Nanni had departed at the end of the 2013-14 season CBS had progressed to the Eccellenza Piemonte-Valle d'Aosta which became the fifth tier of Italian football. However the team lost in the end of season relegation play offs in 2012-13 to Saluzzo which ended in relegation to the sixth tier Girone D of the Promozione Piemonte-Valle d'Aosta. The club had certainly come a long way, as it had nearly four hundred athletes enrolled as of 2015, while it continued to develop youth players. 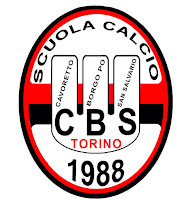 CBS Scuola Calcio will play in the Promozione Piemonte-Valle d'Aosta Girone D in the 2015-16 season. It was only a day before I was about to head to Turin for a two night visit that I discovered the Eccellenza and the links to its clubs. As I had all day Wednesday before heading to the Juventus v Genoa game, it seemed like a good idea to seek out some of the clubs in the competition. After breakfast I set out from my excellent hotel just off the north end of Umberto, I bought myself a one day travelcard for just €5 from a tobacconist by Porta Nuova station before taking the metro to Carducci-molinette. The station was familiar to me as I’d got out there to walk to the Stadio Olimpico the previous year on my way to watch Torino against Sampdoria. I remembered it pretty well when I went upstairs. I just needed to work out where the number 47 bus left from. After crossing the road a couple of times I saw the bus pull up at its terminus stop. I decided to show a local my scribbled notes to make sure that I was on the right track. Unfortunately she misread it and thought I wanted to go to Porta Nuova. Half the bus got involved. I was convinced I was right and I tried to show that all was OK. It was an interesting ride! Sure enough as soon as we crossed the Po I knew where we were as I saw the floodlights on Corso Sicila. The gate at one end was locked and as the street sloped down to the lido, with the pitch fenced in and raised above, there was no way I could see down there. It was time to improvise. There was a wall at the bottom of the fence around the ground. I managed to get onto there to peer over and get my photos. 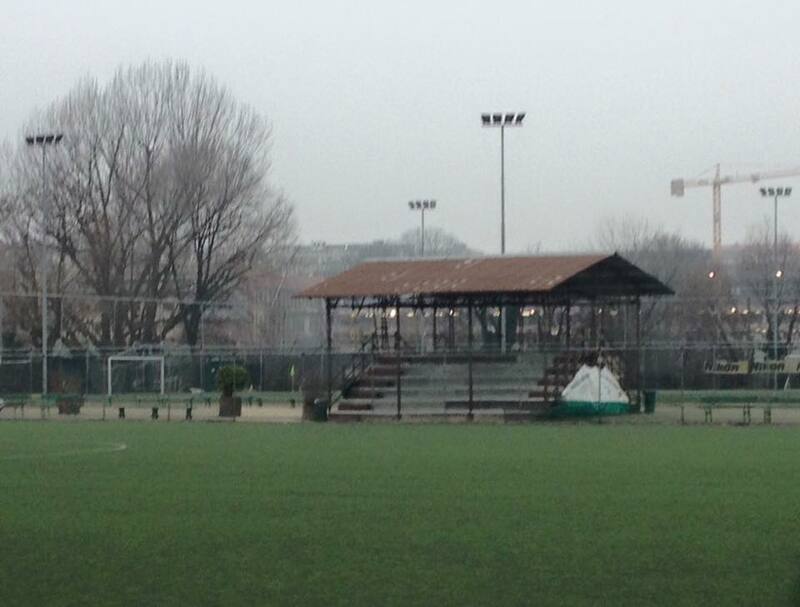 In truth the Campo Cavoretto venue wasn’t much of a spectator venue, although there was a small benched covered stand on the far side. The artificial pitch was tight to the fences on three sides. The club facilities were behind the city end goal. Once done I walked around the corner onto Corso Moncalieri to catch the number 47 bus back to the metro.